We're looking forward to heading to Texas for the 2017 AERC convention! AERC's convention is the most fun you can have without your horse! Two days of informative and thought-provoking seminars on Friday and Saturday, shopping galore, seeing old friends and meeting new ones, awards presentations, Hot Topics seminars, plus fun Friday night entertainment and the awards banquet on Saturday night. Prefer to send in the form by mail or fax? Click here for the printable registration form. From the Hilton DFW Lakes website: "We offer everything you need on 40 lushly landscaped, lakeside acres. Our award-winning hotel features a refreshing blend of spacious accommodations, limitless recreation and unmatched conference facilities. Lose yourself in a unique resort-style setting while enjoying all of the services and amenities of a modern conference center. Recipient of the AAA Four Diamond Award for the past six consecutive years. Find out more at the hotel website. FREE airport shuttle provided from nearby DFW Airport (but not Love Field, which is about 20 miles away). Make your hotel reservations! Call toll-free 800-984-1344, and reference 2017 AERC Convention, or use this Hilton DFW Lakes online reservation link. What to do before or after the convention? Check out some Dallas area attractions. VETERINARIANS: The Veterinary Committee will be hosting a two-day Veterinary Continuing Education course in conjunction with the convention. Watch for details coming your way in late Fall 2016. TRADE SHOW EXHIBITORS: We'd love to have you! Trade show information will be available in the Fall. LV Integrity +/ , owned by Joyce and Dennis Sousa, achieved the exceptional honor of "AERC Perfect Ten Equine" over the weekend at the Gold Rush Shuffle in California by surpassing 10,000 AERC miles. Created in 1997 and sponsored by Joe Long, past AERC president, former Southeast Region director, and member of the AERC Hall of Fame, this award is for equines that have completed 10 years, 10,000 miles, 10 first place finishes and 10 best conditions throughout their career. LV Integrity +/ is only the 9th horse to achieve this honor since the inception of the award. Ridden by Joyce for most of his career (he also carried Dennis, and their daughter Jennifer Niehaus), 23-year-old "Ritzy" earned his miles and Perfect Ten award over 18 seasons. This year was arguably one of Ritzy's best. In addition to his Perfect Ten Equine accomplishment, he achieved his 2016 Hall of Fame induction and his 40th 100-mile completion. 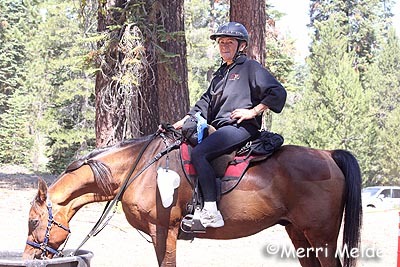 Additionally, Joyce and Ritzy escorted Joyce's granddaughter, Alex Niehaus and her gelding Airborne along 855 miles of trail, including 5 100-mile rides. "Yes, it was a great ride season," Dennis wrote. "We have been truly blessed." What started out as a simple personal goals for two endurance riding Juniors ended up as an exciting, neck-and-neck 'race' throughout the 2016 season for the Junior National 100 Miles Championship. 14-year-old Alex Neihaus, of Cloverdale, California, and 16-year-old Anya Levermann, of 100 Mile House, BC, Canada, both surpassed the previous record of 500 miles in their 100-mile adventures around the country. Alex ultimately finished the 2016 season with 605 miles in 100 milers, riding two different horses, and Anya finished with 805 miles in 100-milers aboard four different horses. For Alex, the competition for the Junior National 100-mile champion "just sort of happened. We just wanted to get out there on the trails," she said. "It was only my first year of doing 100s, so I just wanted to learn about it, how to do it, really. So my grandma decided that she would help me along the way." That Alex's grandma happens to be 24,000-mile endurance rider Joyce Sousa who happens to have two horses in the AERC Hall of Fame, including her 23-year-old mount LV Integrity (Ritzy), was just icing on the cake. "We just did as much as we could, and it was really fun." Alex started riding endurance in 2010, finishing her first LD with her mom Jennifer and dad Jon. Before this season, she had accumulated 1085 lifetime endurance miles and 310 LD miles. Throughout the 2016 season, but for one of the 100-mile rides, Alex rode her 15-year-old gelding Airborne. "I got him in 2014 from a friend, Robert Weldin, who lives in my area in California. Robert got hurt and thought he wasn't going to be able to do any more 100 mile rides. So he gave Airborne to me." Alex and Airborne completed 305 miles together their first season, and 730 the next season. "We've just been really good together," she said. The 100-mile odyssey started in the 20 Mule Team in southern California in February. Joyce and Alex finished near midnight in a ride time of 15:33, for Alex's first 100-mile completion. "I was ecstatic," Alex exclaimed. "I thought it was so cool. It was tiring! I remember we were on the last loop, and I was practically sleeping on Airborne - I couldn't hardly keep my eyes open!" Alex and Joyce's next 100-miler was at Mt Adams in Washington in May. It was one of Alex's favorite rides. "It was hard mountainous terrain, but it was really fun and really well marked," she said. It was a ride where Alex learned about doing what was best for a horse to get him through a 100. Ritzy was a bit tight in the hind end with 15 miles left, so they walked most of that 15 mile loop in the dark. Their finish time of 14:58 still put them in the Top Ten at the finish with horses fit to continue. In June, chalk up another 100-mile finish - and win - in the 105-mile Sunriver Classic in Oregon in June. (105 miles because some radio guys on the last loop accidentally sent riders the wrong direction.) This ride was also, needless to say, one of Alex's favorite rides. Both girls were tied at 305 miles when they both rode the same course in the 100-miler at Santiam Cascade in Oregon in August. They both also finished this challenging ride to remain tied at 405 miles. Alex said, "I wore a bandana around my face the whole day because I rode behind my grandma, and the dust was just terrible. It was a very tough ride. We got lost on one of the loops; we were doing circles. At the end of the ride we figured that we probably did about close to 120 miles." Alex admitted that being lost in the dark was frustrating, but that's all part of endurance riding. "I just dealt with it!" Joyce and Alex finished in eighth and ninth place in a ride time of 17:21 hrs. Alex and Anya were the only two Juniors to ride in the 100-mile AERC National Championship in Utah in September. Both finished to remain tied at 505 miles. Despite Joyce, on Ritzy, and Alex, on Airborne, missing a turn (some bikers had politely pulled over to let them ride by - accidentally obscuring a trail turn sign) and doing extra mileage again, it was an exciting experience for Alex, both for just participating and for completing, finishing eleventh in a ride time of 17:48. It was only a week after the AERCNC that Alex found herself at the starting line of the the iconic Virginia City 100, in Virginia City, Nevada, on a different horse. Airborne needed a rest, and Robert Weldin had hoped to provide a horse for Alex, but it didn't work out. So he enlisted the help of Carolyn Meier, from Nevada, who offered up her horse Silmarils Diamond. "I just hopped on him," said Alex. "I had never even ridden him before, and that was a tough, tough ride. I can't even believe I finished it. I was ready to Rider Option! But I didn't. "The SOBs (the infamous Sons of B*tches hills that you hit during the hottest part of the day) - those were extremely hard. And Diamond was a tough horse, one of the toughest horses I've ever ridden. It was only his second 100 mile ride. He was really extremely headstrong; it was a lot different from riding Airborne! But he was sure on his feet, and he never got tired, it seemed. That was really awesome." Alex's Virginia City 100 buckle left her tied yet again with Anya (who finished a 100 that same weekend across the country) at 605 miles, but it ended up being her final 100-mile ride of the season, while Anya ultimately went on to complete two more. But Alex accomplished her original goal of learning all about riding 100s and completing them. "I learned a lot about pacing and horsemanship and taking care of the horses at the vet checks, that the horse always comes first. And on the trail, whenever we would get the chance, we'd get off and walk or run the horses to give them a break." Anya Levermann's goal was simply to ride as many 100 mile rides as possible during the season. "I knew the 100-mile Junior Championship record was 500 miles, but I didn't necessarily want to beat the record. I just wanted to win the award since it was my last year as a Junior rider." That quest didn't start out so well, when Anya was pulled from her first two 100-mile rides. At the Biltmore 100 in May in North Carolina, Anya's mount Amber Kiera, owned by Dessia Miller, was pulled at 86 miles. At the Titanium 3-day Pioneer FEI ride two weeks later in Canada, Anya planned to ride the 100-milers on both Saturday and Sunday - because what endurance rider wouldn't be up for riding two 100s in a row? It turned out to be a rainy-snowy-muddy weekend. Riding her own 14-year-old gelding, Sey Wiking Tu (Tootsie), on Saturday, resulted in a pull at 40 miles from a slight lameness. The next day she hopped on her sister Katya's horse, 11-year-old Kharmichel LK (Draco), and, riding with mom Katrin aboard Double Exposure PW (Buddy), finished third and fourth in 18:35. "There were only five riders, and one pulled, so we finished third and fourth and last!" Anya said. "My sister is focusing on school this year, so she let me ride her horse." Anya's next 100-mile ride was the Sunriver Classic in June in Oregon aboard the top international horse Monk (the same ride that Alex won). Owner Chris Martin had contacted Katrin earlier in the year, looking for a rider for Monk, because regular rider Lindsay Graham had a baby, and Monk was idling and itching for a ride. What was it like climbing aboard this fast horse, who was part of the USA Team at the Kentucky World Equestrian Games Endurance Championship in 2010? "He did really well; I had a lot of fun riding him. And it was really to nice to ride with Hannah Pruss and Salome." Anya and Hannah had met briefly at an AERC Convention, and she volunteered to sponsor Anya at Sunriver when the word went out. What Anya doesn't mention is that she got sick the last part of the ride and started throwing up. And every endurance rider either knows or can imagine that it's no fun being sick and throwing up while riding on the back of a horse. Owner Chris Martin recalls, "The ride went horrible; it rained and snowed. Anya and Hanna were top 3 or 4 during the last half of the ride, then Anya got really sick. I still remember the look on her face when I told her I had no problem with her pulling. She let us know that she was not pulling!" The pair finished fifth and sixth in a ride time of 14:17. Next, Anya earned a coveted Big Horn 100 belt buckle in July. Riding Draco again with her mom (aboard Buddy) the pair finished the historic ride in 13th and 14th place, in a ride time of 20:26. "That was a hard ride!" Anya recalled. "The whole time we knew we were under a time pressure. And we had heard the stories about getting lost, and we didn't want to get lost. And my mom was also worried about how the horses would do, because they hadn't really done a big mountain ride yet. But the horses did great. They finished with all A's and pulses in the 40's." Next up: the dusty and rocky Santiam 100 in Oregon in August aboard Draco again. Riding with her mom, and with Junior Sanoma Blakeley, the trio ended up finishing second, third, and fourth, when several of the front runners ended up being pulled. They finished in a ride time of 16:30. Anya and Alex - now tied at 405 miles - next shared the trails in the AERC National 100-mile Championship in September. Anya's ride aboard Monk in this one was a bit less tame than her previous one. He was fast and full of beans. "Monk knew horses were in front of him all day. And once we turned for home - forget it!" Riding with sponsor Pam Bailie aboard Bailie Skrit Ablaze, the pair finished second and third in 10:34. Just a week later - the same weekend that Alex was adding the Virginia City 100 to her resume, Anya and Draco, and Katrin and Buddy, zipped down south for the Oregon 100. Riding with Sanoma Blakeley again the trio completed that ride in 15:56, again finishing second, third, and fourth. By this point, both Alex and Anya - tied at 605 miles in the Junior National 100 Miles Championship, had exceeded both their personal goals and the previous record, and it had provided an exciting 'horse race' for those following these two young, tough, enthusiastic riders. Anya went on to complete two more 100s this season. Kevin Waters had offered his horse DE Golden Ali to Anya for the October Las Cienegas ride in Arizona, but when Kevin was unable to ride with Anya, he enlisted Christoph Schork's help. Christoph provided her with GE RR Jazz Dancer (Pinky), and, riding with Kerry Redente and Rushcreek Stub, the pair finished sixth and seventh in 17:15. "Pinky was great!" Anya said. "He was still bouncing down the trail on the last loop!" 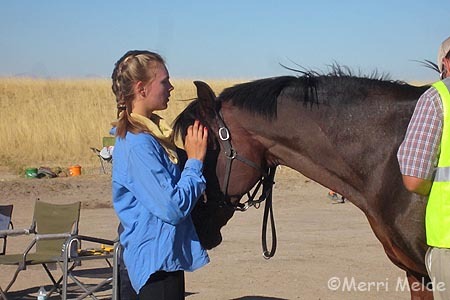 It's not so easy for aging endurance riders to climb aboard strange horses for an endurance ride, and while Junior riders make everything look easy, it gave Anya pause for thought. She said, "This year I rode a bunch of different horses, but most of the horses are trained very well. I'm just nervous sometimes for the start because I don't know how they're going to react. "But I never had a problem. A couple of the 75s I rode this year, I got bucked off on the pre-ride. Most of the horses are very competitive for the FEI, but most of the horses I rode were all really good horses." 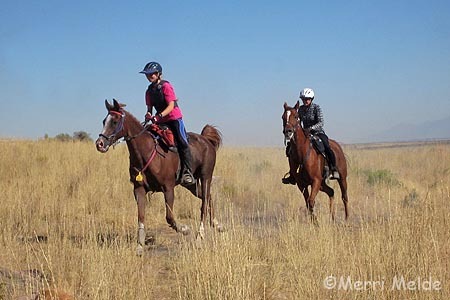 While the two girls jet-setted around the country in what turned out to be a friendly, mild 100-mile championship 'race' throughout the season, neither rider saw it as much more than accomplishing a personal endurance riding goal. And in doing so, both passed the previous 100-mile mileage record of 500. And lest you think the girls rested on their laurels between their 100-mile rides, think again: Alex added 300 more miles of 50s, for a perfect 12 for 12 season and a total of 905 miles, and Anya added another 175 miles, for an 11 out of 13 season and a total of 980 miles. Both girls plan to have a little more relaxed season next year. "The last two years we've really been going hard," Alex said. "So I think next year I'm just going to ride with my dad; he's bringing up a horse that's only done one 50. Maybe I'll do a 100 or two with my mom, and I think that'll be about it." "I kind of have to go to school sometimes," Anya laughed. "I didn't know I was going to the AERC National Championship until the Tuesday before, and on Wednesday school started. The first thing one of my teachers had said was that to pass his class, we had to have good attendance. And then I left for two weeks. "But I still get good grades; I have all As, so I think that's pretty good. But I think I already have 15 absences this year. "Next year, for FEI I want to get my elite status, which is ten 75-mile rides. I think I want to do some more 100s, and do some more rides with [my horse] Tootsie because I didn't get to ride him very much this year." Families and friends of the girls are understandably delighted by their accomplishments. "I am sooo proud of my girls (mom Joyce and daughter Alex)," Jennifer Neihaus said. "It was a wonderful finish to the season." Katrin Levermann echoed that thought. "I am worn out by the travels, but that's what we do for the girls... right!? They work hard for it. And it does seem to pay off at the end. [Katya just got awarded a full scholarship for University - top academic student in her school]. I'm proud of both of my girls!" This season, these two gracious, poised young Juniors set a stellar example for AERC endurance riders of what it means to just get out and Ride. The US Senate has passed the National Forest Service Trail Stewardship Act (H.R.845/ S.1110), which would direct the Forest Service to take action to address the current trail maintenance backlog. The move has been applauded by the American Horse Council, which has made trails a priority. The AHC has been working with Backcountry Horsemen of America, the Wilderness Society and many other recreational groups to advance the bill. The passing of the act follows House passage of the bill earlier this fall, introduced by Representatives Cynthia Lummis (R-WY), Tim Walz (D-MN) and Senators Mike Enzi (R-WY) and Michael Bennet (D-CO). A June 2013 study by the Government Accountability Office (GAO) found that the Forest Service has deferred trail maintenance needs that exceed half a billion dollars, and only one-quarter of the agency’s 158,000 miles of trails meets agency standards for maintenance. This maintenance backlog is causing access and safety issues for equestrians and all trail users on national forests. The Board of Governors of the Western States Trail Foundation honors the memory of Walt Tibbitts, an amazing man whose devotion and contributions to the Western States Trail, to the Tevis Cup Ride, and to the horses and people who challenge them, is legendary. Walt passed away after a short illness on November 7, 2016 at the age of 93. Infusing the imperatives of the present with the best of the past, Walt’s steady guidance helped the WSTF meet many challenges along a winding trail that spanned 45 years. With the wisdom of experience and unfailing good humor, his values were a keystone for the Foundation, and the energy and motivation he possessed continue to inspire. As a young horseman with the heart of an explorer, Walt was intrigued when he first heard about this crazy 100-mile adventure held annually in his beloved High Sierra. After a successful Tevis debut in 1967, he was totally hooked — by both the excitement of the sport of endurance riding and the magic of the Western States Trail. With Tevis Cup completions in each of four successive decades (1967, 1968, 1969, 1971, 1972, 1973, 1988, 1990, 1991, 1996), Walt earned the coveted 1000 Mile Buckle in 1996, notching a Haggin Cup win along the way in 1969 with his wonderful Appaloosa gelding, Ruff Spots Banner. What makes the Kristina Chesterman Memorial Ride so special isn't just the riders, the horses, the camp, the trail, or the prizes, or even the cause, but the feeling. It's going down the trail and knowing you are riding for something beyond just miles, points, or finishes. It's that feeling you get that you are keeping a memory alive, that feeling that we are all connected somehow, in our shared passion for horses with a girl who died too young. Amber Clark is a local Northern CA rider and trainer who broke her back earlier this year after falling from a horse. She will be going through extensive rehab, and won't be able to train or ride for awhile. She has been an active member of the endurance community and a good friend to many, and we are proud to give a little Pay-It-Forward to her! Kevin Myers left us earlier this year. He was such an influential human being, a talented ballet dancer, a runner, a rider, an advocate for the well being of horses, and progressive in his hoof care work with horses and the EasyCare company. A small donation is being made to Rusty James Toth, in Kevin's memory, which will go to the American Foundation for Suicide Prevention. Current TEAM leaders as of October: OTV Pony Tails, Picked The Blazin Belles, High point individuals in the TEAM competition are Debra Tibbitts, Heather Accardo, Cassandra Green and Claire Morris. In the One Horse One Rider competition: Erin Hurley is leading in OTV and Jen Moore in the Picked/Cooked division. Seedling Success: Leonardo Fuentes is our “out of the pod” leader. Our group has had a few regional meet ups this season. The last was hosted by the Daniel Boone Distance Riders at Rendezvous October 8th. Nearly all of our Midwestern riders showed up for the gathering and Two Horse Tack graciously sponsored some beautiful prize give-aways to those in attendance. 2015 was our first season of competition and we had many members among AERC endurance riders at large who helped support the cause. As we segued into year two we focused more on commercial sponsorship, lower rider fees, and bringing our “brand of bean” forward to make our riders recognizable as a vital segment of the endurance riding community with t-shirts and matching splashes of lime green tack. Deb Moe kept the technology straight, and I have worked the sponsorship end and served as emotional cheer leader for the group, while Maranda Bibb has lovingly nurtured a new small but important segment of our group called Seedling. 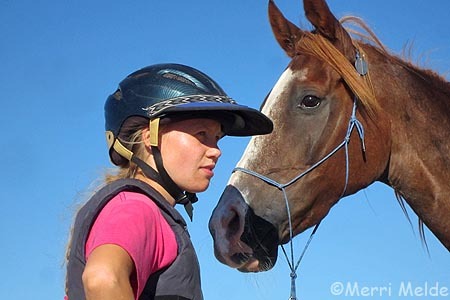 The cuteness and effort of these kids is amazing. .
"Many off-track Thoroughbreds and owners are more suited to recreational riding than to showing," said Kristin Leshney, T.I.P. coordinator. "The Thoroughbred Recreational Riding Incentive Program enables recreational riders to be rewarded for choosing Thoroughbreds." "We are excited to have more Thoroughbreds becoming part of the T.I.P. program and gaining recognition for their diversity as equine partners," Leshney said. The 2017 Anne Ayala Scholarship applications are open to AERC Juniors and Young Riders in good standing from their high school senior year through age 21 (must be younger than 22 as of 1/1/2017). The award honors Anne Ayala, who with her horse Overlook Nuryev ("Beau") received the Pard'ners Award in 2000 and became a Decade Team in 2003. Be sure to fill out the application and send it in for arrival by 1/7/17.